WHEN TO WALK AND HOW LONG WILL IT TAKE? 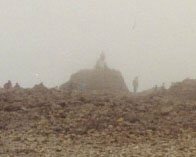 The Novice Walker should not attempt to walk up Ben Nevis between November and May, or during bad or cloudy weather. The normal time taken to climb to the top by the tourist path is three and a half to five hours - coming down is much faster, between one and a half to two and a half hours. The walk is just over 4 miles each way - a total of 8 1/2 miles in all. 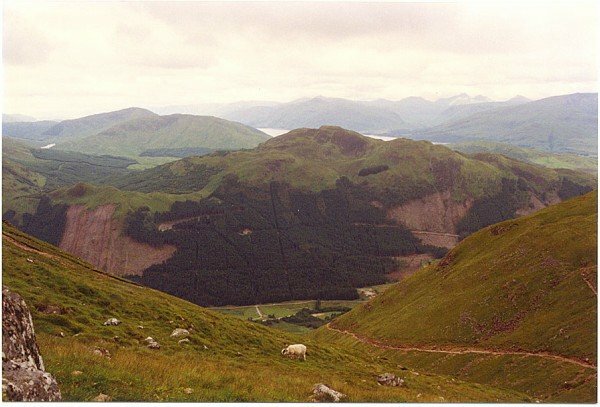 The Ben Nevis Tourist Path (often called the Mountain Track) is the only path which should be attempted by the novice walker. It is strongly advised that you return by the same route and that you take a map and compass with you. Many people, attempting an alternative, have become struck by the sudden steepness which they incur half way down the hill although the route looked easy from the top. If fog suddenly descends (as is very likely at any time of year) you could be in real danger. 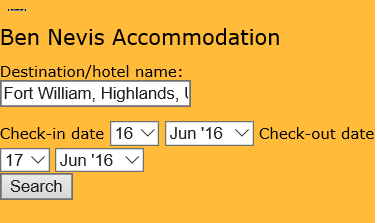 More detailed information about traveling to Ben Nevis by car or public transport can be found on here. The postcode for the Ben Nevis Visitor Centre is PH33 6PF. Before you start your walk check the Ben Nevis Weather Forecast - if high winds, heavy rain/snow, low cloud is predicted then postpone your walk for another day. Before you start make sure you are properly prepared. The most important item is proper footwear. Trainers are not suitable footwear for this path as it can become very slippery when wet. The temperature at the summit is just below freezing on average, so make sure you take warm clothing with you. Tip: Take a camera with you and start snapping those breathtaking views as you go up. The weather will probably change as you climb, and you'll be able to take some beautiful shots as the clouds move over the mountains. You may find that the cloud cover has come down by the time you reach the top, and you can't see anything at all! To get to the start of the walk follow the signs for Achintee, Claggan Industrial Estate, and then take the turn to Achintee where the Tourist Path starts. Your starting point is about 20 metres above sea level, so you will be ascending 1,324 metres to complete your climb. The Ben Nevis walk lets you know what you are in for from the beginning. After crossing the bridge over the River Nevis you will start to climb steeply using the steps conveniently provided. After this initial bit of steepness, the path does even out to a more moderate slog. The path is very well trodden, and apart from in very poor weather, hard to miss. You will also find yourself amongst other walkers - this is not a walk to take if you like to be completely alone! The parth winds up the mountain, presenting you with different views and photo opportunities. It is fascinating to stop and look around you, gradually seeing the hills opposite and then starting to rise above them, until eventually you are higher than anything else. You'll be climbing steeply to the saddle by Lochan Meall an t-Suidhe at around 570 metres. This is the Halfway Lake. Apart from your human companions, you will pass sheep on your way - while your legs are aching they will seem to mock you with their effortless agility on these rocky slopes. As you take your rest breaks, you can look up to the Ben and see the path zigzagging above you. Once at the end of the switchbacks, you will think you are nearly at the summit. By this point your legs will be telling you that you can' go much further and the terrain changes from pleasant green to the dull grey of the rocks. You feel the end is in sight and will be tempted to stop and ask someone who is on their way down (you can recognise them by their triumphant - albeit tired - expression) how much further you have to fo. Be warned - the reply will be something like 'another two hours, mate.' It is at this point the novice walker will feel like crying, giving up and will have thoughts of going home. But don't despair, you can do this! And be looking forward to when you're the one coming back down and smiling sympathetically at those struggling up and optimistically asking you if they are almost there. And this time it will be you passing on the bad news. In fact, there are still 700 metres to go once you start on the zig zags, but perhaps not knowing this at the time is better. Once on this lunar landscape, the path is only just distinguishable from the rocks around it, and in bad weather easy to lose. It is fairly common to have to climb through snow here, and the cairns you will pass with crosses poking out of them mark the spots where bodies of climbers have been found. This is a serious walk, treat it as such, and STICK TO THE PATH. If the weather is so bad you can't see your way and you haven't got a map and compass (and the knowledge to use it), turn back and try another day. The scree consists of rocks and pebbles and is fairly loose, so can get slippery. As a novice walker, you will become very tired, but remember, you are not in a race. You will be close to your goal, and it would be a shame to give up now. So pace yourself - if you have to stop to catch your breath or stretch you muscles every couple of minutes, DO. There is no shame in taking this final part slowly. Sit down a while, take a break, explore the ruins of the old observatory (you may find you need to take shelter within the walls on a windy day) and then start to think about making your way down. Don't plan on doing anything very strenuous that evening or the next day - your legs won't let you. Depending on your level of fitness and how used to walking up and down steep slopes you are, you may find it takes a few days before you can easily tackle even the gentlest of inclines again. But who cares? You have reached the top of the highest mountain in the UK - be justifiably proud of yourself. You've earned it! The mountain is there to be conquered, and inspires people every year to make it to the top. For every person who makes it, it's a personal challenge. Some make it harder for themselves by carrying strange things or wearing strange clothes. Or pole dancing at the top! Robin Beadler, a physically challenged ex-serviceman climbed Ben Nevis on crutches and has provided a brilliant guide to the walk. And of course, there's pictures and the story of pole dancing at the summit! If you haven't yet read about the history of the Ben, check out the Ben Nevis facts page and learn that there was actually once a hotel on the summit! And read about Wragge, and think of how this 19th Century meteorologist walked up and down the mountain every day! And of course, if you think you can make it to the summit and back in under two hours, you might want to enter the annual Ben Nevis Race!